Much has happened since I discovered earlier this week that people use persimmon seeds to predict the type of winter they will be having. First, I figured out, through some kind comments and by looking at other pictures on the web, that we had not actually found the true cutlery in Robin's persimmons. It turns out that you have to actually cut the seeds open, not just the fruit, as shown in this picture. Ah, now I see. The shapes of cutlery are much clearer. Or are they? Second, I learned again the power of social media. The pictures of persimmon seeds shown here are from Chris at Soules Garden, which is just a hop, skip and a jump from here. Chris saw my request on Facebook for some persimmon seeds from trees relatively close to me and sent me this picture. I am confident that Soules Garden and May Dreams Gardens will have the same weather this winter, so these seeds should provide me with a prediction of my winter. Third, I realized that while some shapes are obviously spoons or knives, other shapes are a little less specific and could be spoons or forks. To assist me with interpreting the predictions of the persimmon seeds, I asked for some assistance from some of the occasional - what shall we call them - personas on my blog, namely Hortense Hoelove, Thorn Goblinfly, and Dr. Hortfreud. Here's what they thought about predicting the upcoming winter by the cutlery shapes in the persimmon seeds. 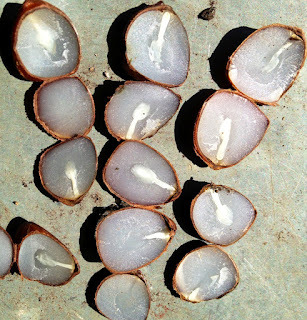 What do you see in the persimmon seeds? You can see that I have labeled the Knives, Spoons, and Forks as I see them. Based on this, I would expect you will experience some heavy, wet snows and some light, fluffy snows this winter, and it will be cold. Don't even think that winter will be mild like last year. As if. Nope, it is going to be a typical Indiana winter with a little bit of everything. Garden fairies here. We are garden fairies and we are delighted to have been asked to interpret the persimmon seeds to help prognostic, ponder and predict the winter that is coming this way. It thrills us no end that someone sent Carol a picture of persimmon tree seeds because there for a day or so we thought she might get the idea to plant a persimmon tree here at May Dreams Gardens so she could have her own seeds. We are garden fairies and we just want to say that we've heard that such a tree can be quite messy, dropping fruit all over in the later summer and fall. Though, as garden fairies we would have done our part to collect the persimmons and save them for pudding. We love pudding. Who doesn't? Though our preference is for chocolate pudding. Do you think we could get Carol to plant a cocoa tree here? Now that would be useful. We could use the chocolate for hot cocoa, too. Oh boy, that would be good in the winter time especially. Oh, dear. Sorry. We got off track there. Here's our prediction for the upcoming winter. As you can see, we think that what some are labeling as spoons are actually forks because they are straight across at the top, and everyone knows that spoons are rounded at the top. Based on this, we think it is going to be a cold winter with mostly light fluffy snows, which are our favorites, so we admit that we are garden fairies and that might just be some wishful thinking on our part. There might also be some wet, heavy snows. Regardless, we are garden fairies and we'll spend most of the winter here in the sunroom, because it gets so cold in the winter time, so it matters not to us how much snow and what kind we get, though sometimes the snow fairies care. Hey, maybe we need to ask the snow fairies? Submitted by Thorn Goblinfly, Chief Scribe for the Garden Fairies at May Dreams Gardens. I see that you are predicting the upcoming winter weather using persimmon seeds. Would you like to know my interpretation? Well, yes, as long as it is your interpretation of the meaning of the persimmon tree seeds and not your analysis of my state of mind. Fair enough, here's what I think. I think it will be a cold winter with some wet, heavy snows. Dr Hortfreud, you haven't labeled all of the seeds. That's a good observation, Carol. I'm still studying some of these, trying to decide if the are forks or spoons. Oh, when will you be done with your observations? In due time. I don't like to rush my predictions and prognostications Maybe March? Good to know. Thanks Dr. H.
And there you have it, three persimmon seed predictions of this upcoming winter from Hortense Hoelove, Thorn Goblinfly and Dr. Hortfreud. By March, we can look back and see who came closest in their predictions. Carol, please tell the fairies that they can come over and get all the persimmons they would wish. in the blog they said they liked pudding. please tell the fairies that chris loved being part of their world for a short time.